**This post contains affiliate links. Should you click on a link, an FCS team member may receive a small commission. 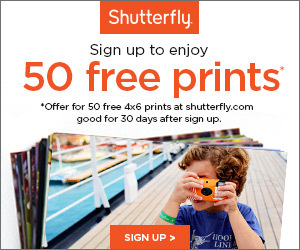 Shutterfly Freebies are the BEST! Ignore the Banner – the FREEBIES are below! I’ve reaped two free magnets in the past. The magnet that is a set of four – and let me tell you, they are fabulous! If you aren’t into magnets, may I suggest you think Xmas stocking stuffer or a gift – maybe for Grandparents Day? I know this is thinking way ahead – but seriously, you’ll be that much ahead of the game. You’ll need to use the Promo Code: ONE4ME to reap the savings. Terms: Offer expires May 10, 2015 (11:59 P.M. PT). Offer is good for one free magnet, 12 4×5 flat, 12 3×5 folded or one set (24) of address labels through shutterfly.com or our mobile-friendly site. Must select one of the four products listed. Offer cannot be redeemed more than once per account and/or billing address. This particular offer code can only be redeemed once. Taxes, shipping and handling will apply. Not valid on glass magnets, other print sizes, other products, prepaid plans, prior purchases, orders placed for in-store pick up and purchases made on the Shutterfly apps. Valid for the intended recipient only. Cannot be redeemed for cash or combined with other offers or credits. Not valid for resale.